Recognize obsessive thoughts that can cause worry and panic, and gain the skills to change unhealthy feelings of distress in everyday life. It is only human to worry about problems in our lives--but for some, obsessing for weeks and months, avoiding social events and situations due to feelings of panic can become a regular part of our lives. If any of these describe you or a loved one, then you or they may be almost anxious. Those of us who are almost anxious may never address the issue because we don't fully meet the diagnostic criteria for an anxiety disorder. 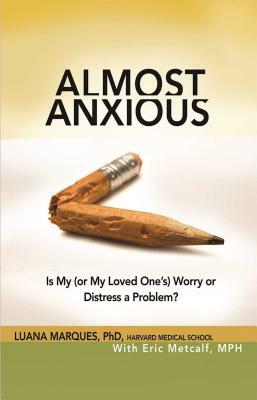 In Almost Anxious, Luana Marques, PhD, describes the spectrum of almost anxiety symptoms, from normal situational anxiety on one end to a full-blown diagnosable anxiety disorder on the other. Drawing on case studies and the latest research, she gives you the tools to: assess whether your or a loved one's worry is a problem; gain insight on how to intervene with a loved one; discover proven strategies to change unhealthy feelings of distress; gauge the physical, psychological, and social impact of your anxiety symptoms; and determine when and how to get professional help when needed. Luana Marques, PhD, is an assistant professor at Harvard Medical School and a licensed clinical psychologist in the department of psychiatry at Massachusetts General Hospital in Boston. At MGH she also directs Psychotherapy Research and Training as well as the Hispanic and Clinical Research Programs at the Center for Anxiety and Traumatic Stress Disorders. Marques lives in Boston, Massachusetts. Eric Metcalf, MPH, is an Indianapolis-based medical writer, editor, and health educator. He has authored or contributed to dozens of books on health and fitness, including the best-selling Doctor's Book of Home Remedies line and other popular book franchises. He has also contributed to several magazines, including Prevention and Better Homes and Gardens, and health websites, such as Health.com. He has a degree in journalism from the University of Missouri-Columbia and a master's in public health. Metcalf lives in Indianapolis, Indiana.